Shortly before Christmas in 2009, I had a photo shoot with a woman named Joan. Her friend booked the session as a gift, and we had a beautiful sunny day for it. 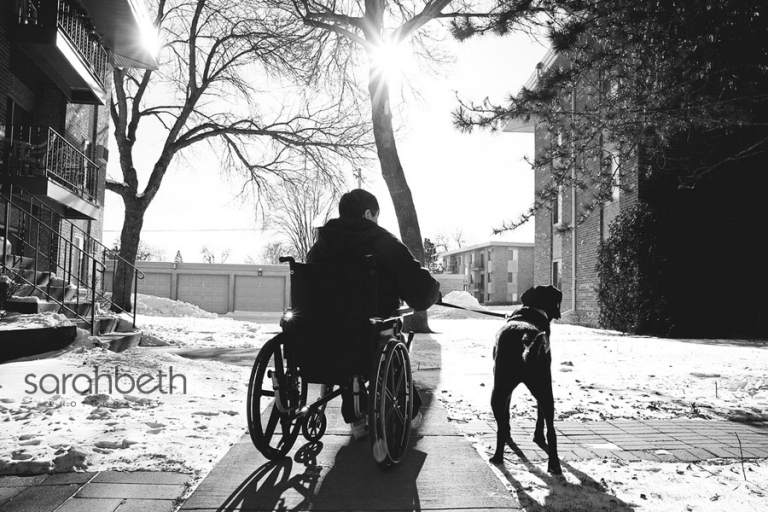 Joan was living at home in Hospice care and relied on the companionship and day-to-day help of her Service Dog, a Black Lab named Joy. 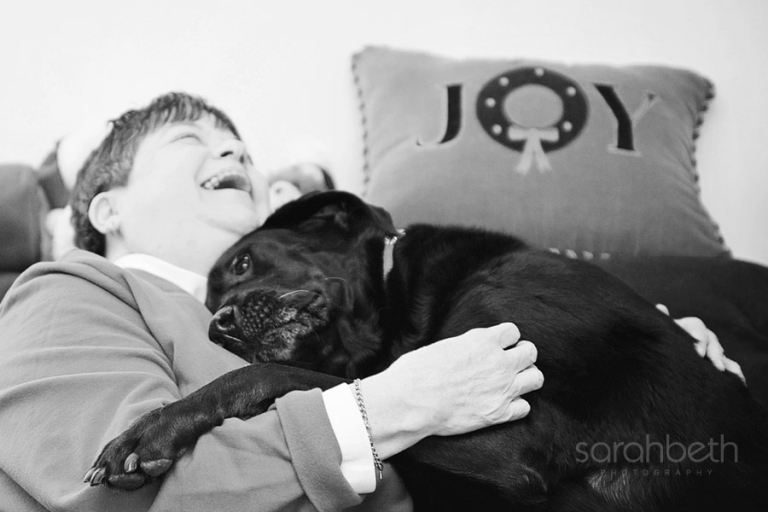 Joy was her rock, her best friend, and had saved Joan’s life on more than one occasion. She would let Joan know when her blood sugar was low, and if she was about to have a seizure. Joy would place herself under Joan to break her fall, stand firm to help her up, and was by her side day and night. I came into this session knowing that Joan didn’t have much time left, but I had no idea I’d be meeting such a vibrant, funny, happy woman. She was so blessed to have Joy come into her life, and her eyes lit up with every story she told of her. She said that Joy was her “gift from God,” and taking these photos had given her something wonderful to look forward to. Their bond was palpable, and it was easy to see that both of them were very loved. Her apartment was filled with the word “Joy” in artwork and pillows and Christmas decorations. She even wore a “Joy” sweatshirt during our session. We sat and chatted for a long time. Joan’s zest for life, even with her declining health, was a breath of fresh air for me and helped me see that what I do is meaningful and important in so many ways. Without knowing it at the time, she and Joy sparked the idea to offer photo sessions specifically for pets that are nearing the end of their lives. For so many people, their pets mean the world to them, and I want to provide an opportunity to capture what makes them so special, especially in such a difficult time. My first “official” Joy Session® was with a Bernese Mountain dog named Griffin, in January of 2010. I really didn’t know what to call this service, and “Emergency Session” was the first thing I could think of. It sounded so cold and impersonal, and I struggled with what I should really call it. A few days after posting Griffin’s blog, and receiving some very nice suggestions from readers, I realized the perfect name was sitting right in front of me. I couldn’t think of anything or anyone I’d met who embodied such love and such a deep connection as Joan and Joy. These sessions really are for people who want to celebrate the happiness — the joy — their pets have brought to their lives. So, as a loving tribute to an amazing woman, her dog, Joy, and for everything that “joy” means for you, I’m so, so happy to offer this service.